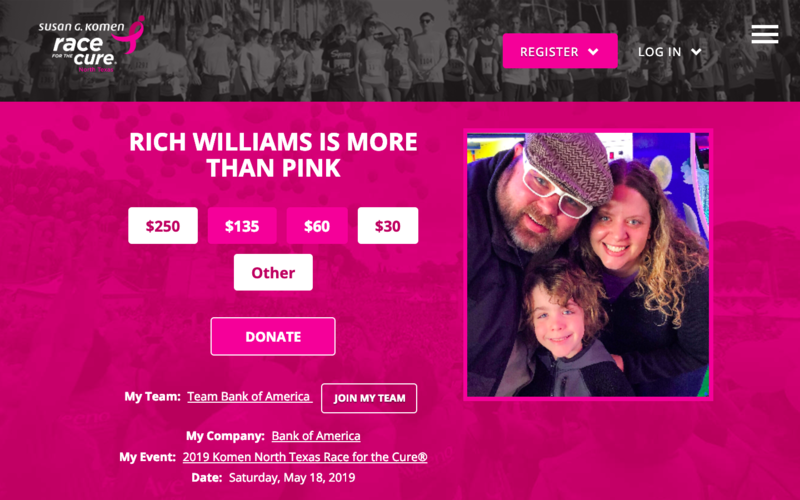 Visit richlovesboobs.com to learn about Rich’s participation in the Komen Race for the Cure. She spends thirty dollars at the makeup counter boutique. She tries to hide her ugly with shades of blue and pink. I think she once spent ninety on a care bear tattoo. And if she could only find me, she’d say goodbye to you. You. She wears some old clothing she bought at garage sales. It makes up for her knowing and once again she fails to be what you expected or even comprehend these battles that defeat you. You called yourself her friend. She’ll make up for it once more. She will find the words you were searching for and you, you will pay for this one day. When she remembers and decides to go away. To stay. She remembers things now. The sadness that it brings now. In her mind it rings now ’cause all she knows is you. She calls you from the payphone at her hotel/resort. She needs to buy a ticket, a ride to the airport. She says she wants to see you. She misses you again. These battles that defeat you, you called yourself her friend. What are you waiting for? Your skies are blue again. You need to find someone, you’ve lost your only friend. What are you waiting for?Who’ve you got to blame? You remember how he looks, but you don’t know your name. You told him you’d be back again. Like you always do. He’s expecting you. So what are you waiting for? He needs you more than he ever did. And he’s gone. You need some room to breathe. He’s still haunting me. Feels so terribly. Tell me what’s wrong my friend. Your skies are blue again. He’s not gonna hurt you any more. What are you waiting for? I spoke with a friend today about web content and thought leadership. I shared a website with him of someone in his industry that is doing a great job of marketing to consumers using thought leadership in a particular geographic region. Geography and the web seem very different, as we know about the world-wide-web, but what about my region-specific-venture? HubSpot’s (actually) free inbound certification course including an amazing exam for proof on your LinkedIn profile! WordPress’s free SEO-rich blogging platform is free, you can add your domain for $13/yr. plus the cost of the domain. Those can be acquired for $0.88 on namecheap.com.